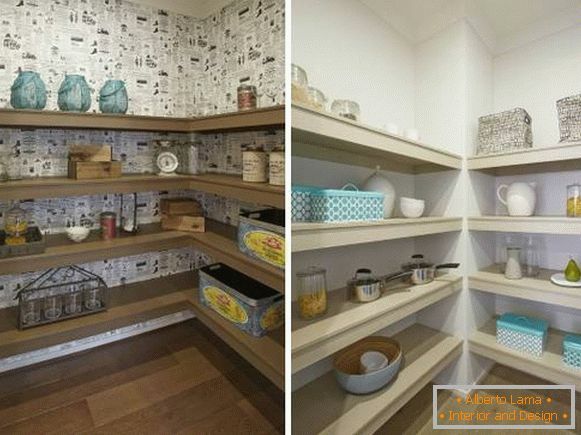 Storage in the apartment can be used for storing supplies, conservation, dishes, cleaning products etc. 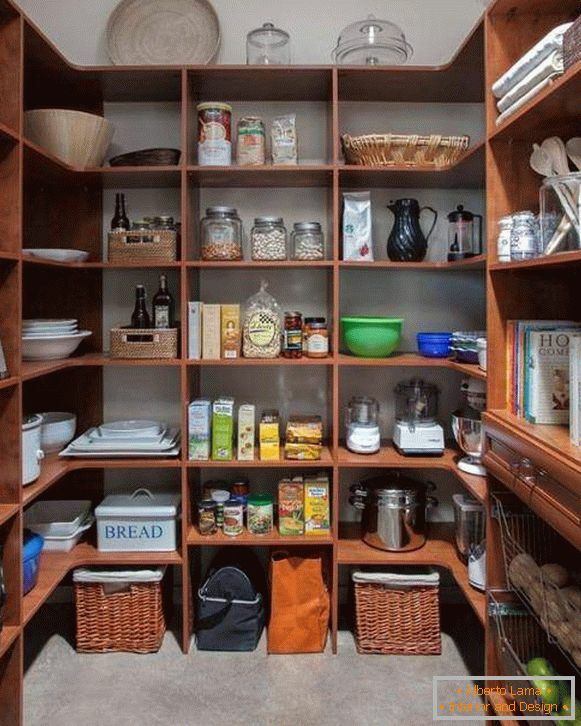 Many of these items should be stored separately: cereals - in a tightly closed container, where pests do not penetrate; vegetables - in well-ventilated boxes; washing - away from food. 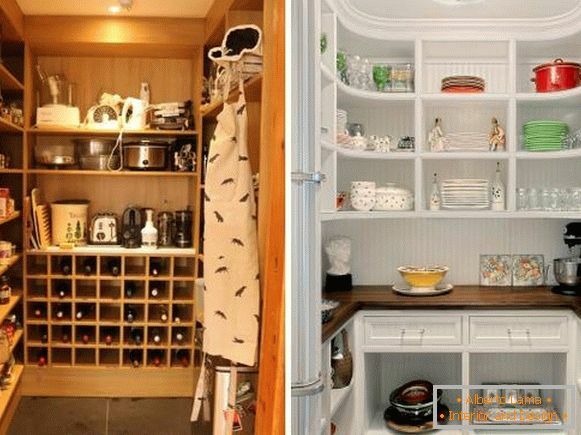 Therefore, the design of a small storage room requires careful organization. 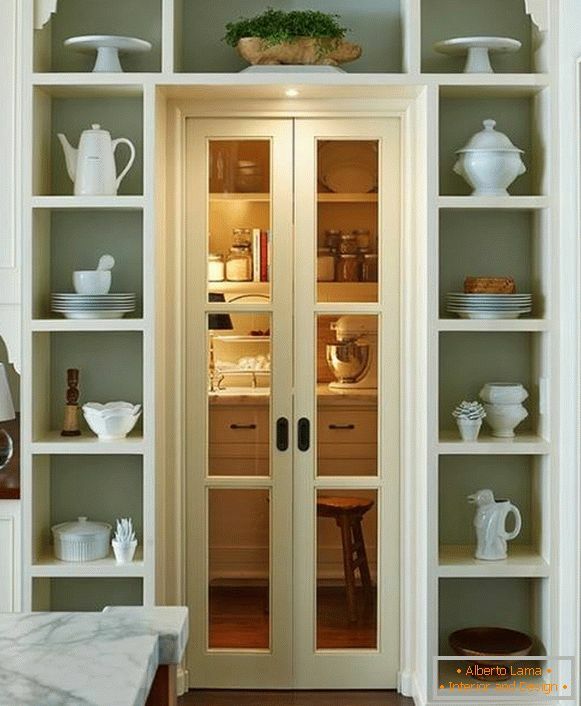 Every thing should have its own specific place. 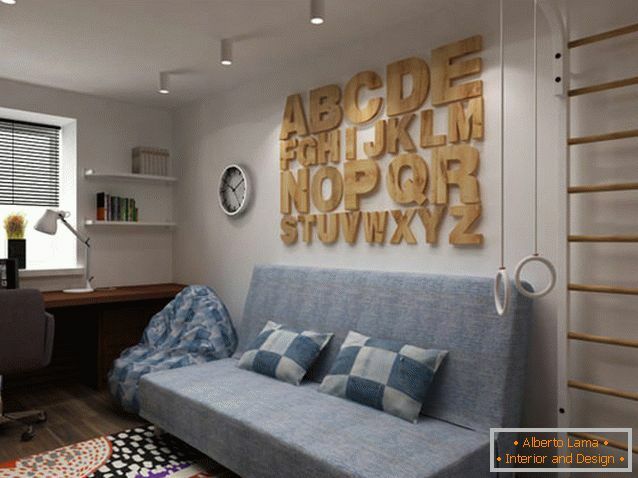 How to achieve this, when the size of the room leaves much to be desired? 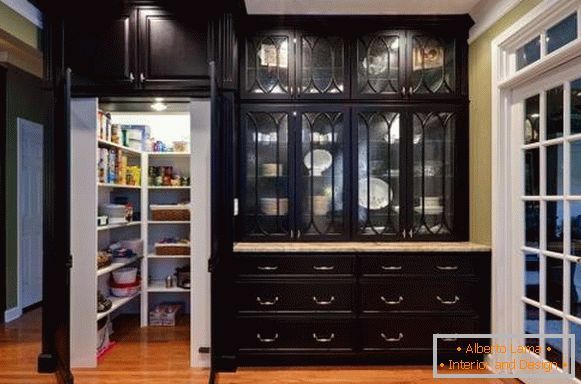 Learn more with a selection of 10 ideas and 20+ photo pantries! 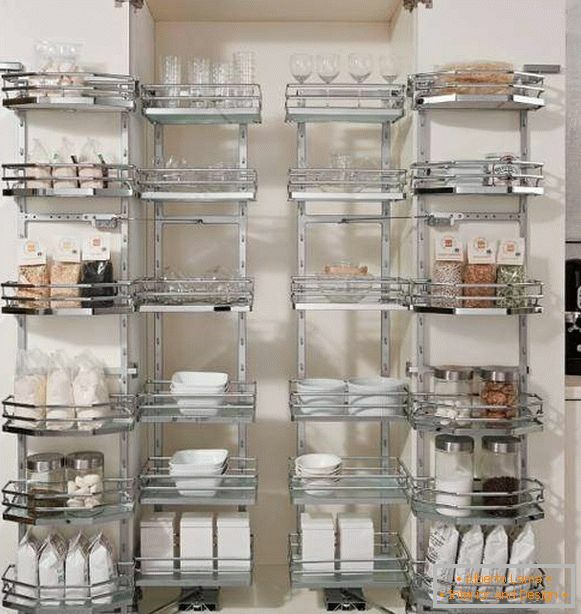 High metal and wooden racks allow you to double the amount of useful space in the pantry and make storage of products more manageable. 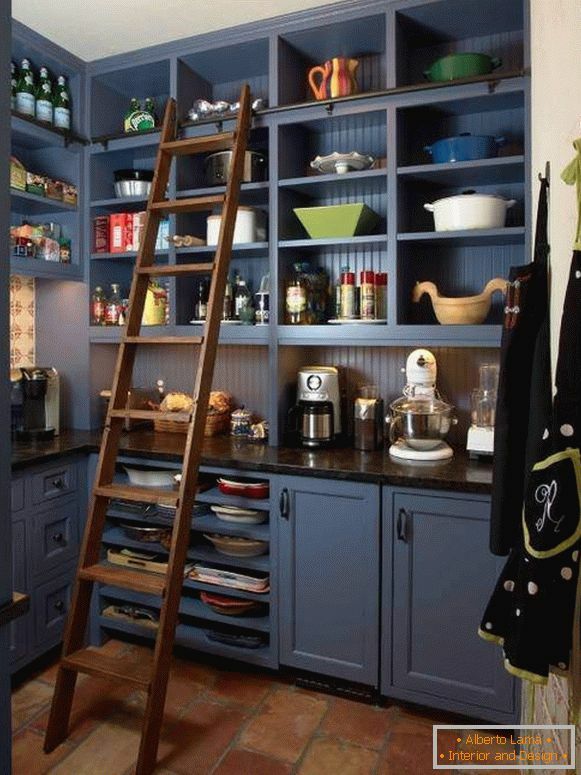 A mobile staircase or stool will help you get things off the top shelves under the ceiling. 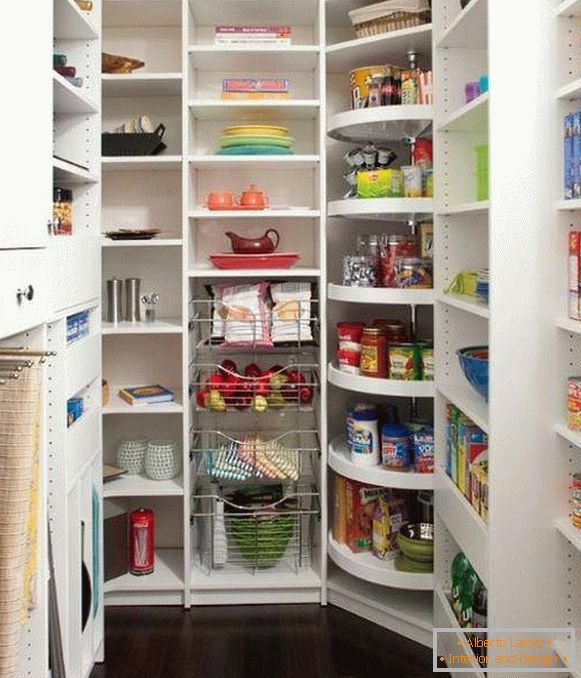 The built-in closet in the pantry, which will fit tightly to the walls and ceiling, will make the room design more cozy and spacious in appearance. 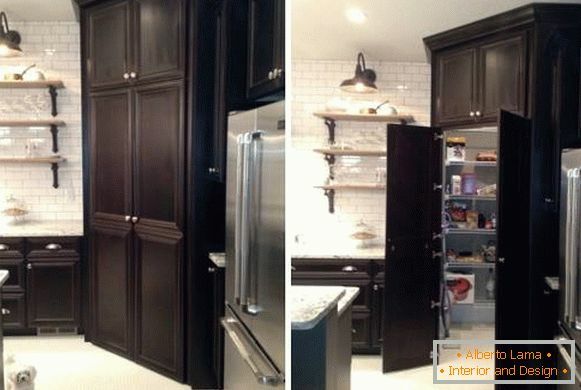 How do you find the cabinets in the photo below? 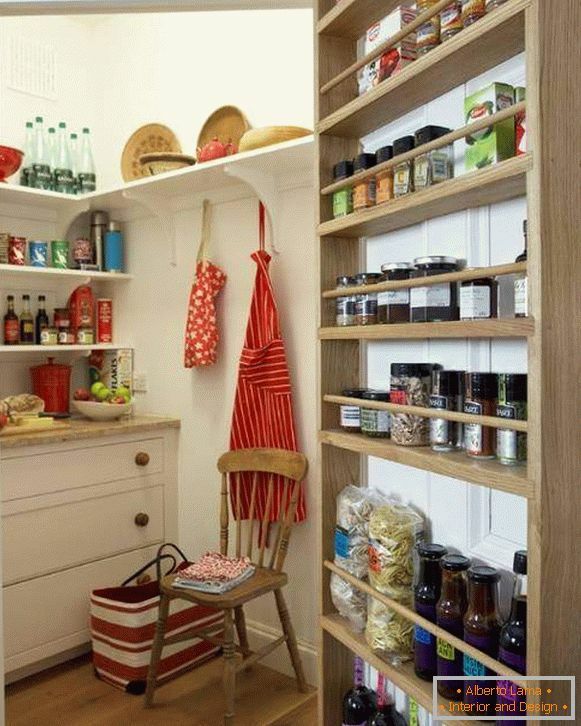 Angled shelves allow maximum use of space in a small pantry. 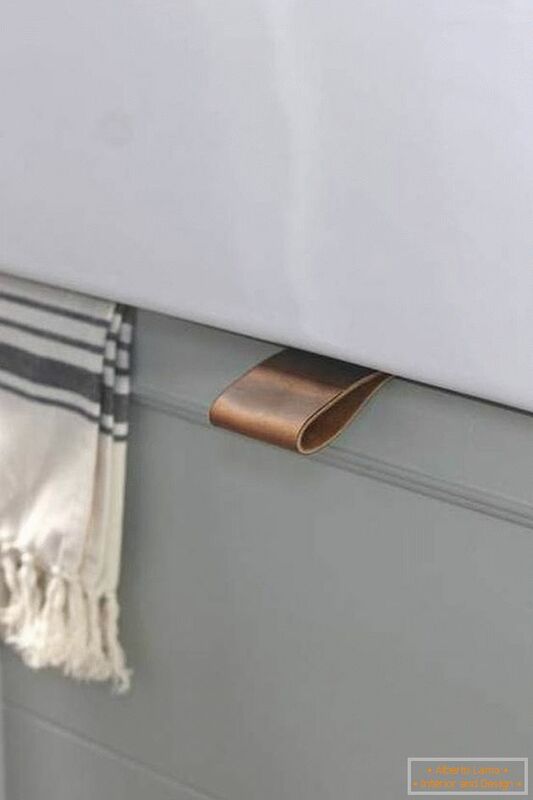 Especially worth considering is the possibility of installing a rotating corner unit, which makes it easy to get deeply hidden objects. 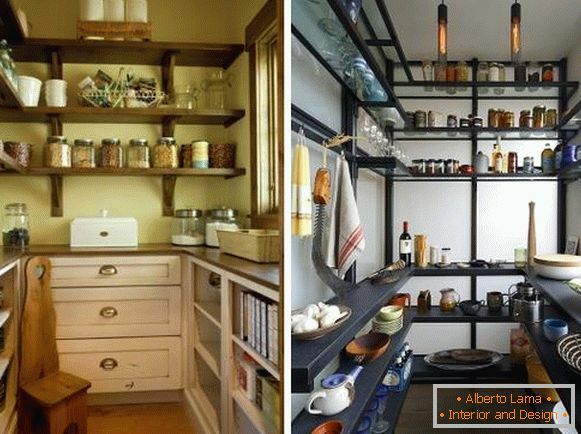 Also read: Secrets of a small space - how to visually enlarge a room? 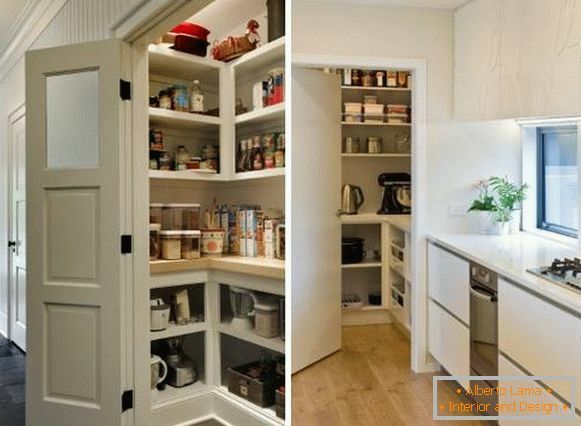 Choose a compartment or usual sliding doors in a pantry, if you want to save space not only inside this room, but also outside. 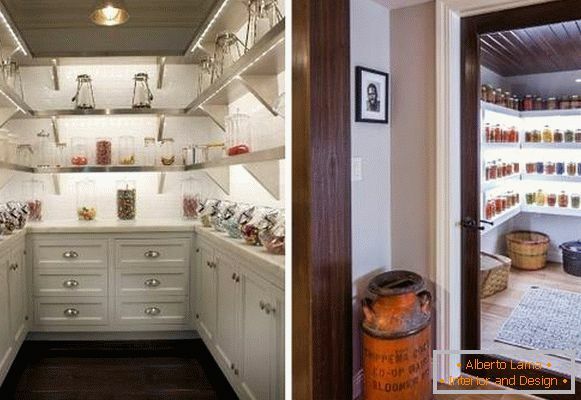 Choose swing doors that will open in the corridor, kitchen or other adjoining room? Then why do not you equip them with additional shelves? 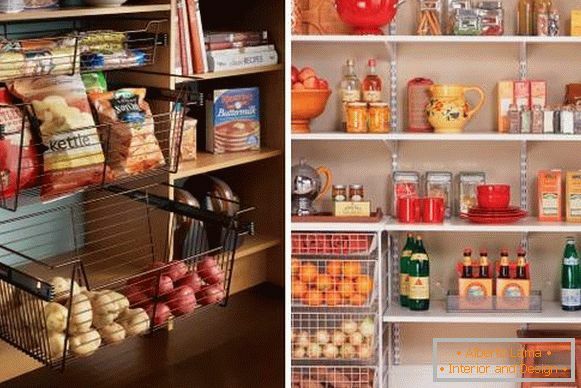 Metal mesh boxes and wicker baskets are ideal for storing potatoes, carrots and other vegetables. 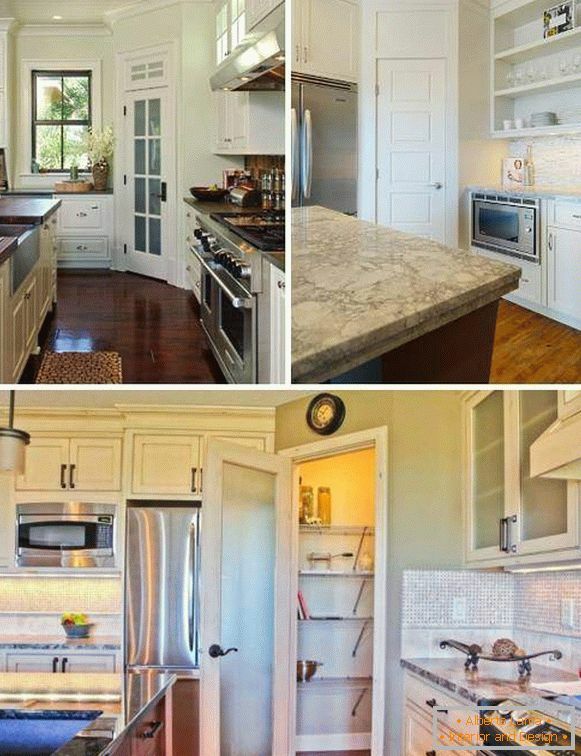 They are well ventilated and do not allow moisture to accumulate, which leads to decay. To ensure a level surface and easy maintenance, the bottom of these boxes is recommended to cover with organic glass, cardboard or plywood. 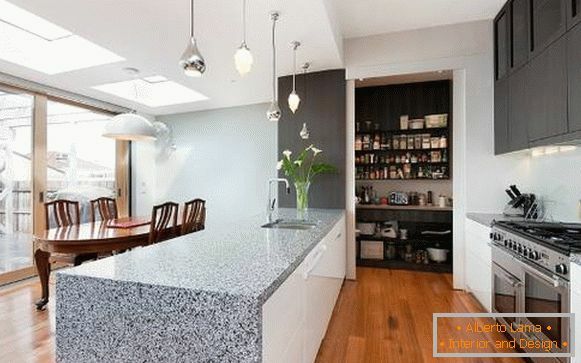 Also read: Intelligent sliding systems for the kitchen, which every mistress dreams about! 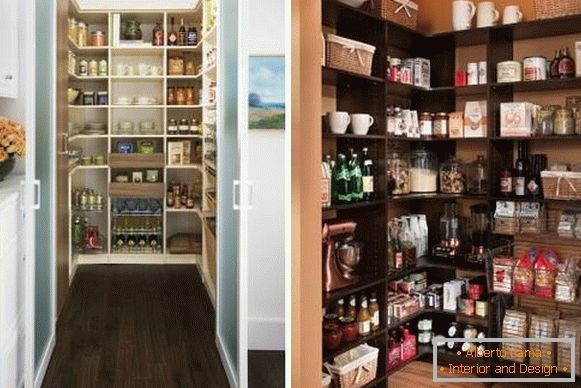 Spices one place, cereals other, conservation third etc. 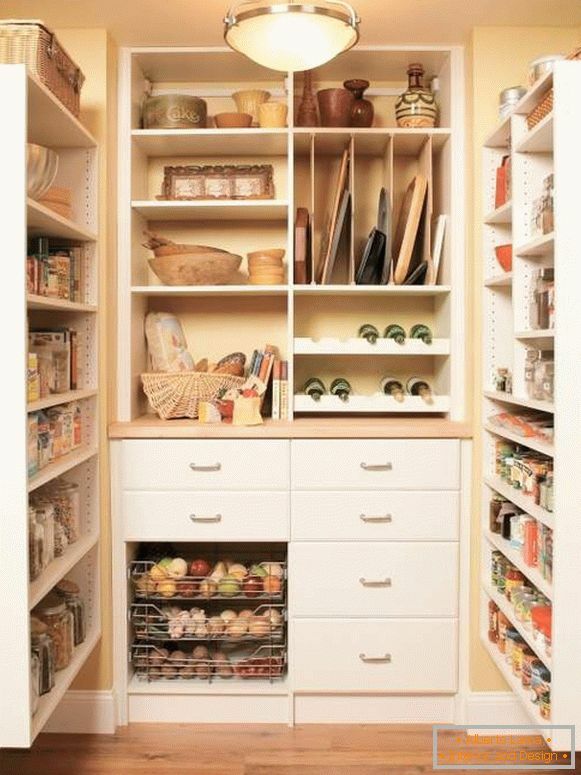 We stick to this rule every time we put things in order. But over time, everything is again mixed in a heap. At the next cleaning we find long overdue cans with condensed milk, moldy cheese, and also a source of unpleasant odor in the form of cabbage. How to solve this problem forever? 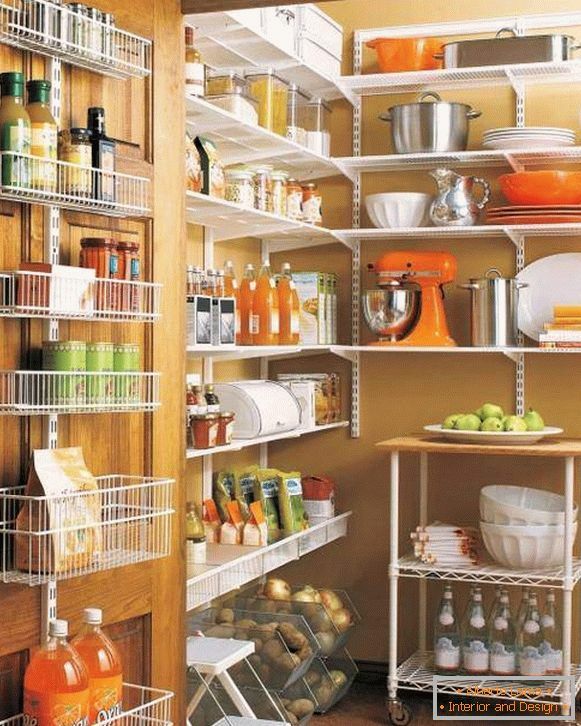 Tip: Try to place products on the shelves according to the alphabet or in order of expiration of their expiration date. 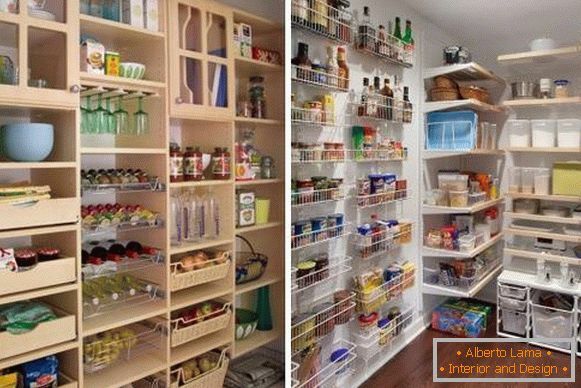 The built-in LED backlight or spotlights will allow you to clearly see the contents of all corners and shelves, and also make the design of the small storage room more comfortable and free. 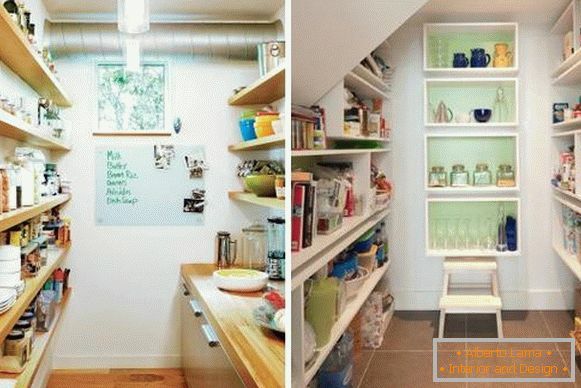 What if you do not have a storeroom at all? 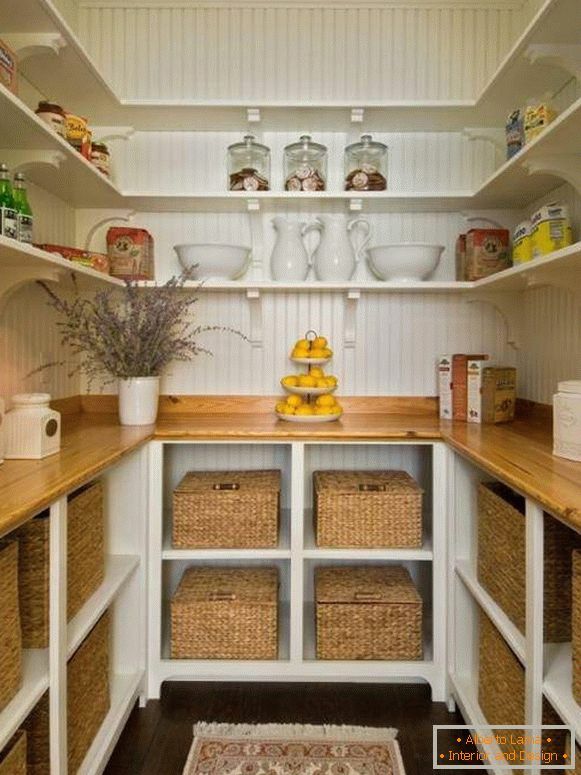 Then you can arrange a closet in the corridor or a corner storage in the kitchen under the pantry! A photo of such interesting decisions completes our article.